North African country of Berber, Arabic and European influences, Morocco is a great place of culture in the continent. For tourists, its climate and landscapes make it a must-see to visit, with more than 11 millions of visitors in 2017. If you decided to go to Morocco for your next holidays, here are some of the best places to explore. With the privilege of being the largest Mosque, the later is known under different names: Jami ‘al-Kutubiyah Mosque, Kotoubia Mosque and the Mosque of the Booksellers! 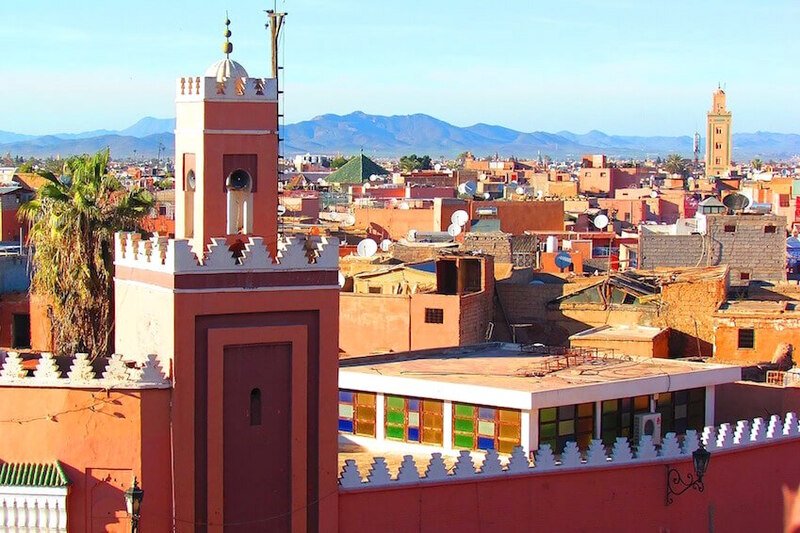 Located in the medina, in the south-west, in Marrakech, the building was built under the Berber dynasty in 1120. Today, it is a place of prayers for Muslims, and an architectural masterpiece to visit for tourists. Organized in a “T”, as it is a tradition in the country, it has naves supported by several white pillars. It also has a room able to welcome up to 20 000 of faithful. Thus testifying of the importance of the religion in the country, the Mosque promises a full immersion in the Moroccan culture. If you’re curious and interested in religious buildings during your trips, you won’t be disappointed by Koutoubia Mosque! On a picturesque geological site at 1060 meters of altitude in the Atlas massif, Ouzoud waterfalls is one of the most beautiful site of the country. With 110 meters of altitude from the peak, the falls really are spectacular. Surrounded by rocks of earth colors, as it is pretty common to see in Morocco, and in the heart of a tourist site where you might get a chance to see local animals, do not miss this fantastic walk in natural lands! Alone, with family or with an expert guide to tell you more about the park, you will discover everything about this natural marvel that is still not very known among tourists today. A Not-to-be-missed! If you also dream of discovering the magic and the work of these 2 creators, do not miss the opportunity to have a walk in this garden of pleasant charm. Moreover, this activity is for the whole family! True symbol of Marrakech, Jemaa el Fna is inescapable during your trip in Marrakech. Traditional, popular and animated, the place attracts more than a million of visitors each year. Yes! Between snakes charmers, street concerts, storytellers as it is traditional and all kind of food displays, the place is undeniably the most animated spot in the city. From morning to the end of the evening, the place provides a cultural setting like it is rare to see outside. And if you would like to take some distances with the crowd, why not admiring the view from terraces on the surrounding roofs? Several good addresses indeed provide delicious cocktails by contemplating the show of the place. An efficient way to participate while keeping your own space! Running over 38 000 ha 70 km away from the south of Marrakech, Toubkal national park takes its name from the peak Jbel Toubkal, in North Africa, with 4167 meters of altitude. Thanks to a breathtaking biodiversity, the park seduces each year families seeking nature and rare landscapes. Valleys, rivieras of transparent waters and animals such as dall sheeps and eagles live in heavenly groundbreaking environment. With an exceptional sun despite the snow, let yourself be charmed by this hypnotizing creation of nature.